A well-formed conscience is essential to make moral decisions. 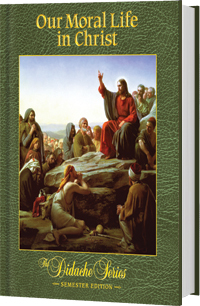 This text aids the formation of our consciences by presenting an overview of the moral teachings of the Catholic Church. Following the Ten Commandments as elevated and perfected by Jesus Christ and the Beatitudes, is shows how we, aided by God's grace, can imitate the life of Christ in every circumstance of our lives. It examines topics important to social justice and the sacredness of human life.